TurboActivate & TurboFloat 4.0 Released! No-click verified trials, improved fingerprinting, and much more! Previous: TurboActivate 3.4.7 is out! We’ve just released TurboActivate 4.0 and TurboFloat 4.0. With these new releases comes some huge improvements and features. Read on for details, or if you want to jump right in, get them on your API page; it’s free for all LimeLM customers (whether you’re on the free plan or one of our paying plans). Probably the biggest visible feature of this release is the new verified trials functionality in TurboActivate. This means you can offer trials to your users that are verified with our servers, cryptographically-signed, and locked to that machine, all without having to give your customers a product key ahead of time. What this means is that a potential customer can download your trial software from your website, and begin using the trial immediately. All of the “magic” of starting the trial for the machine, and making sure customer changes to the machine don’t “reset” the trial, are handled by TurboActivate and our proprietary computer-fingerprinting algorithm. With our new no-click verified trials in TurboActivate 4.0, there’s no need to collect email addresses of customers. They can just start your app and TurboActivate & LimeLM will work behind the scenes to start (or resume) the trial of your app. Another feature about our new no-click verified trials is the fact that the customer can’t reset them. Even if the customer completely wiped their hard drive, re-installed their operating system, and re-installed your app, the proprietary hardware-fingerprint algorithm in TurboActivate & LimeLM knows that the computer has already started the trial, and the user will continue exactly where they left off. There are no limits to how many times you can extend the trials for potential customers. 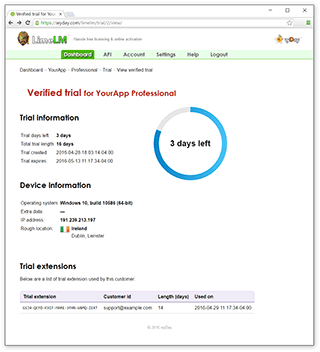 One of the benefits of this new no-click verified trial system is the ability to track in real-time who is trying your app, how long they used the trial, and how many people are trying it. All of the plans now have a verified trial limit based on the assumption that about 5% of trial users convert to be paying users. For example, the “Solo plan” (the $11/month plan) has a 300 activation limit, and a new 6,000 verified trial limit (meaning 6,000 different computers or devices can use the verified trial of your app). Our hardware fingerprinting technology has gone through 4 major iterations (and countless minor iterations) over the past decade. This latest iteration is our best by far (and is a major leap over our last iteration). We’ve eliminated all known real-computer fingerprint false-positives and false-negatives on Windows, Mac OS X, and Linux. We’ve put a lot of work and testing in this latest iteration to make sure your customers have a great experience using your app. In previous versions of TurboActivate only a single thread in your app could use the library functions. Now any thread in your app can use the TurboActivate functions and TurboActivate internally handles the access controls. Added in TurboFloat 4.0 is the ability to limit exactly which username on which platforms can request license leases from the TurboFloat Server. Read more about per-seat licensing here. All of our products now completely support IPv6, all while maintaining full compatibility with IPv4. This means you can use TurboActivate, TurboFloat, and LimeLM in any environment and know it “just works”. TurboActivate and TurboFloat work with any programming language or scripting language. But we like to write example apps and help articles to speed along our customers’ development. The two newest examples added to the list are for TurboFloat: Delphi (7 and newer) and VBA (Visual Basic for Applications) for Windows and Mac OS X. We dedicate a lot of time making online activation as fast as possible for the end-user. This means if we can trim off a millisecond here or a millisecond there we will. And we’ve been doing that steadily over the past year, making the speed of the activation about twice as fast as it was this time last year. Also, we’ve significantly improved our throughput capability (meaning we can handle many, many more activations and verified trials per-second). This is by no means the end of the line. We have a ton of speedups coming over the next year. The faster we make the activation and verified trials processes the happier your customers will be. We’re not done – not by a long shot! This year we’re making a whole slew of improvements to every one of our products. And we’ll be rolling them steadily. The next big update is coming to the LimeLM web interface. It’s old, it’s ugly, and it desperately needs some love. So that’s what we’re going to focus 100% of our concentration on over the coming months. And instead of rolling it out in one “big update”, we’ll roll it out gradually.